Are there choices of styles and patterns? 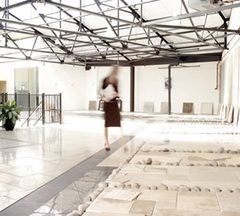 For stone flooring, Stonell has square tiles that can be laid in a grid, diamond or brick bond patterns. Rectangular tiles can be laid in grid, brick bond or herringbone patterns. Aged stone comes in repeating patterns of different sized stone that recreate the random feel of Roman paving patterns. Honed limestones and travertines can be cut into hexagonals and laid with insets to design a Georgian style floor. Contemporary floors suit large tiles. There are a huge variety of designs to choose from and will certainly be a style to suit all projects. Aged stone floors are perfect when looking for a sympathetic material for period homes or renovation projects. A tumbled, brushed or chipped edge stone floor in a repeating pattern, with different sized tiles mixed together, works particularly well for that authentic antique look and complements other natural materials such as original timber beams and old wooden doors. Antiqued unfilled travertine with a brushed surface and softened edges are ideal for barn conversions, restoration developments and listed buildings where a textured surface and rustic style is required. For an eclectic look, aged stone can be mixed successfully with minimalist furniture and accessories. Honed limestone has a smooth matt surface and straight lines, which lends itself to clean uncluttered modern rooms or classical interiors. Why Choose Natural Stone Flooring and Tiles? 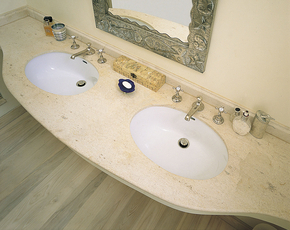 Natural Stone is beautiful and will add a stunning feature to any home. Stone is the only material that improves with age, it lasts a lifetime and its natural variation adds character. It is hardwearing, very practical and gains its own patina over time. It is worth investing in natural stone as it lasts for years and will enhance the value of your home. It is easy to clean, practical yet stylish. The price of natural stone has decreased in recent years making it a luxurious yet affordable floor covering. Natural stone flooring comes in many styles and can suit both a traditional and contemporary setting. It is a very adaptable material that is at home in a country cottage as well as an urban townhouse or apartment. Ideal for hallways, kitchens, dining rooms, conservatories and bathrooms and increasingly being used in living areas and bedrooms. Stone goes well with other natural materials such as wood and works particularly well with under floor heating. Natural stone flooring is unique as every tile is a one off and this look cannot be recreated by man-made material. Fossils, shells, crystal veins and tonal variation are all marks of authenticity. A limestone is a sedimentary rock. It is made up of layers of calcium carbonate formed from the accumulation of organic matter in shallow seas, which is then turned to stone by millions of years of pressure. Limestone comes in a variety of density and hardness and some rare limestones are as tough as granite. For flooring, ensure you buy a hard limestone. Selecting a French Limestone from Stonell would be a good choice. Basalts are igneous rocks, which mean that they have been formed from liquid magma which has solidified after being ejected by an erupting volcano. Basalt, like Granite, is a very hard stone. For ease of maintenance, we recommend all stones used inside should be protected with Lithofin Stainstop. Basalt if generally very good value, but beware of buying rejected stock too cheaply on the internet, as it may not turn out to be quite the bargain you hoped for. Sandstone is generally described as a sedimentary rock consisting of grains of sand cemented together and compressed over millions of years. Due to its large grain size, textured surface for grip and high porosity, this material is excellent for exterior paving but generally not suited for interior use. York stone is a type of sandstone and we offer similar looks with thick riven Indian flagstones and sawn pavers from Spain; all are excellent for pedestrian areas, patios and terraces. Stone is not inherently cold. On the contrary, stone is wonderful at heat transference and retains heat for long periods. If you have a well-insulated house with modern central heating then a stone floor will normally be a few degrees below the ambient temperature of the room. The floor temperature will also depend on what is underneath the floor (i.e. the subfloor) and how well insulated it is. If you are laying a natural stone floor onto a concrete screed it may be worth considering the now affordable luxury of under floor heating. For that added comfort, electric under floor warming systems such as Devi radiates a gentle heat across a stone floor as well as providing warmth for bare feet. How do I care for a stone floor? All natural stone is easy to keep clean, once it is properly protected with Lithofin Stainstop. Your tiler applies this protecting liquid at the installation stage. Stonell recommends this silicone-based sealant as it impregnates the stone and gives it a protective layer which helps prevent staining when saturated. Lithofin Stainstop does not change the colour or appearance of the stone and will not change the surface finish. The Stainstop will also protect the grout. Any liquids will rest on the top of the stone, ready to be quickly wiped away with a paper towel or damp cloth. Once the stone is protected thoroughly at the installation stage, then ongoing maintenance is simple and easy. General cleaning only requires sweeping the stone with a soft broom and mopping with warm water and a stone soap such as Lithofin Easycare. (Use a bucket with two compartments, so that you rinse the mop and remove the dirt rather than just spreading it around.) To prolong the life of your stone floor it is best to avoid the use of bleach, acidic or abrasive cleaning products. Good entrance matting will also reduce the amount of dirt and mud walked into the house. Stonell can offer advice on treating and maintenance of our stones.